You will need to schedule a 6 and 12 month appointments at time of your acceptance of the program. You must have the StainGuard Protectant applied at the 6-month cleaning. 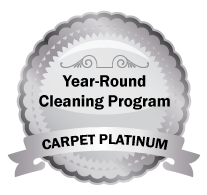 Clean Sweep will require full payment for 6-month cleaning if the 12 month cleaning is not completed as scheduled. We will send reminders of the 6 & 12 month cleanings. All work is 100% guaranteed. Remember… it is the most thorough cleaning ever or it is FREE! !